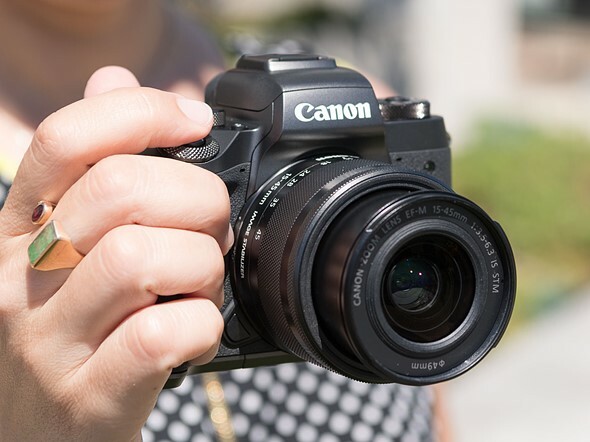 Canon’s EOS M5 is a small, lightweight but powerful APS-C format mirrorless camera, which uses the same sensor and on-sensor phase-detection autofocus system as the EOS 80D. What a long, strange trip it’s been. Eight years have passed since Panasonic unveiled the Lumix DMC-G1, the world’s first DSLR-style mirrorless camera, and for much of the intervening time, Canon has appeared content to let its competitors lead the charge away from traditional DSLRs. In that time, mirrorless cameras have gotten faster, their sensors have gotten bigger and the introduction of 4K video has created a new class of genuine ‘hybrid’ products that have carved out a distinct technical niche compared to their DSLR forebears. Then-Chief Executive Masaya Maeda of Canon – pictured at the Photokina tradeshow in Germany, in September 2014. 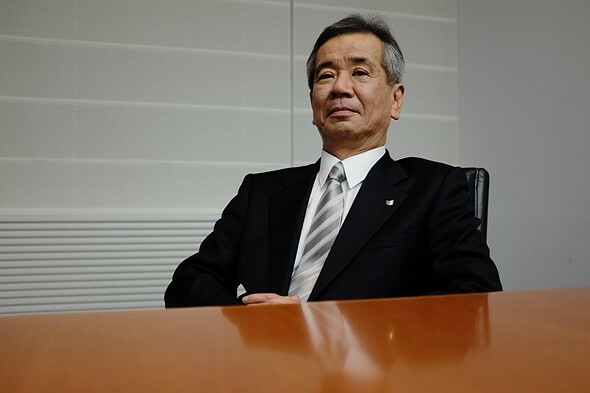 Mr Maeda has since been promoted to President and Chief Operating Officer at Canon Inc. In 2014, Canon’s then-Chief Executive Masaya Maeda promised us a serious mirrorless offering ‘in the very near future’, but until now, the closest Canon has come to delivering on this promise was the EOS M3. Canon has never seemed to know how to market the EOS M series*, and insisted at launch that the M3 would not be available in the USA even as Maeda claimed he was telling the his global divisions to “sell it!” Six months later, they finally decided that perhaps they should. Now, a year after the EOS M3 belatedly entered the US market, we have the EOS M5 – the ‘4’ having being skipped over, possibly in deference to a rather inconsistently applied Japanese superstition. The EOS M5 is a fine product, and one that I think arguably represents Canon’s most sure-footed move in the non-professional space for years. But it is also a massive disappointment. Let’s start with the positives. The EOS M5 basically takes the still and video imaging pipeline from the EOS 80D, and puts all of that hardware into a smaller, lighter body with full-time live view. The 80D’s sensor is good – it’s not market leading, but it’s better in some respects than the sensors used in the 70D and 7D II – and despite the equal pixel count, better also than the 24MP sensor that found its way into the EOS M3. I called out ‘full-time live view’ as a positive because perversely, one of the highlights of the EOS 80D’s handling experience is its behavior in live view mode, when on-sensor Dual Pixel autofocus comes into play. With the EOS M5, it’s all Dual Pixel, all the time, but without having to hold the camera out at arm’s length. All of this, plus the full-time touch-screen adds up to a really, really nice handling experience. A schematic of Canon’s Dual Pixel CMOS AF sensor structure. The top layer illustrates the light-gathering micro-lenses and conventional Bayer-type color filter array. The lower layer shows how each pixel is split into two photo-diodes, left and right, which are colored blue and red respectively. So why is the M5 such a letdown? Because this is the camera that Canon should have released at least two years ago, when Dual Pixel AF was first introduced in the EOS 7D II, and when the company still had a chance to really ring the changes in the mirrorless market. We know that Dual Pixel autofocus is a serious differentiator, and if you’ve been paying attention to our coverage of Canon’s various high-end DSLRs for the past couple of years, you do too. And the M5’s touch interface is lovely. But unless they’ve held and used the EOS M5 (and with more chance of finding a Lapras** on the streets of your town than a dedicated brick and mortar camera store, a lot of people’s first experience of holding a new camera is taking it out of the box), DPAF isn’t the kind of function that’s necessarily going to grab the attention of a potential buyer. Like – say – 4K video might. Or a super high frame-rate mode, or slow-motion movie capture. Of course as we all know, specs aren’t the whole story. Luckily for Canon, handling and performance go a long way. The M5 probably shoots fast enough and well enough for most photographers, its 1080p video probably looks basically fine,**** and it’s very nice to use. Although recent Sony cameras have been loaded with an almost unbelievable amount of technology, shooting with one, whether it be an Alpha or a Cyber-shot can sometimes feel unpleasantly like playing chess against a supermarket self-checkout machine*****. Canon at least knows how to make cameras pleasant and uncomplicated to use, while many Sonys still feel like they were designed by the same user interface team responsible for this. If you don’t remember Sony’s late-to-market iPod competitor, don’t feel bad – nobody else does either. In fact, despite its comparatively pedestrian feature set, given the choice, I’d take an EOS M5 out with me over a Sony Alpha any day of the week. But I really believe that this shouldn’t be an either / or thing. I don’t think that photographers should be required to choose between a sensible, well-designed but feature-limited camera or a cutting edge, highly advanced but annoyingly fiddly one. For videographers who started out on EOS DSLRs this is a particularly irksome choice. 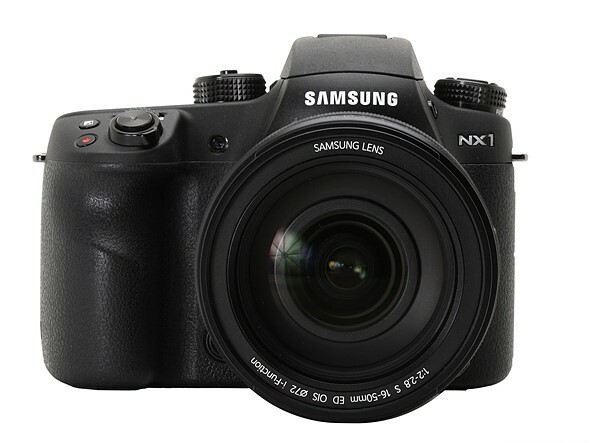 The Samsung NX1 was ahead of its time when it was released in late 2014, and even now, its spec sheet is remarkably competitive. One of our favorite cameras of the past decade, the NX1 was quietly killed off by Samsung, along with the rest of the NX lineup, late last year. Behind my nagging feeling of anticlimax with the M5 is a principle, which is this: Companies that take risks, and deliver new technology to as many people as possible should be given credit. And companies that do not should be held to account. Take the Samsung NX1 – an APS-C format camera so far ahead of its time that even now it has arguably yet to be bettered. In short, it was a vastly more capable camera than it probably needed to be. As such, the NX1 (which benefitted from an aggressive and effective series of firmware updates) encapsulated the best qualities of the company that made it, just as its premature discontinuation, along with the rest of the NX line, could be said to reflect the worst. The EOS M5 is undoubtedly Canon’s best mirrorless camera yet, and at least in terms of core stills photography it should prove competitive against cameras like the Sony a6300. But as a former Canon user and a long-time Canon watcher, I can’t help feeling let down. 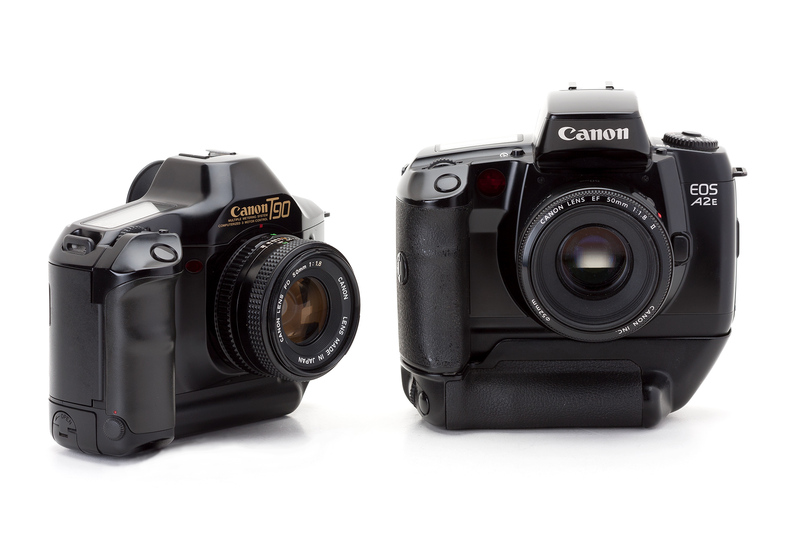 The Canon T90 from 1986 (left) and 1992’s EOS 5 (A2E in the USA). Both incredibly innovative, game-changing SLRs in different ways. And both released a very long time ago. 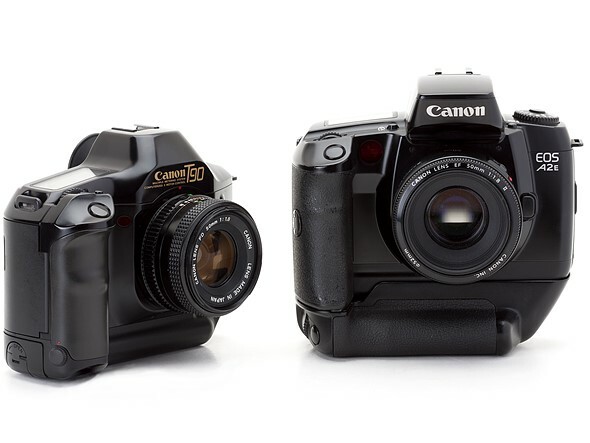 Canon, after all, is the company that first put a microprocessor into an SLR. It cemented autofocus as a professional feature, not a gimmick, and later created the first multi-point AF systems. Canon introduced optically stabilized SLR lenses, too. It was Canon that gave us the first large-format CMOS imaging sensor, the first sub-$1000 DSLR, and the first practical full-frame digital camera******. Hell, arguably the first practical digital camera. Canon is the company that created the still-gorgeous T90. And Eye-Control autofocus, for heavens’ sake, which – granted – didn’t always work, but still feels like science fiction******* even today. How many of those innovations date from within the past ten years? Not one. Before you jump to the comments section and start flaming me, I’m not saying that Canon has stopped doing cool things. That’s a common refrain of habitual Canon brand-bashers on DPReview, and one that I don’t agree with. Apart from anything else, it’s perfectly logical that in a maturing market, paradigm shifts will occur with less frequency. And let’s be fair here – Canon can, and does, innovate. If you take a look at Canon’s camera and lens lineup from PowerShot to Cinema EOS, it’s clear that the company is capable of formidable technical achievement. For all that, many of Canon’s biggest contributions to the consumer digital imaging market in recent years have taken the form of iterative refinement, not wholesale reinvention. And in my personal opinion, this is a shame. Because reinvention used to be what Canon did better than anyone else. * It’s a Pokemon thing. Ask your kids, assuming you can locate them. ** Early press briefings on the EOS M were memorable for the unwavering insistence on the part of Canon’s PR team that the M was being marketed primarily to women and smartphone camera upgraders. *** I write this in the full knowledge that there are some of you who do exactly that. **** We shot an entire video with the EOS 80D earlier this year. It’s fine. ***** Try it. The machine will persist in maintaining that you didn’t make your last move, when you definitely did, and after going back and forth a few times making you pick up your piece and put it down again it summons a teenager to assist you. ****** No, I’m not counting either the Kodak DCS-14n or Contax N Digital. ******* Eye Control AF was introduced in the EOS 5, in 1992, almost a quarter of a century ago. I like to think that if Canon had persisted with development we could be shooting with mind-controlled cameras by now.